Illegal aliens are not a bright bunch. They fail in their own country and seek the succor of the welfare state in the US. What takes the cake as to their failure in life is the new rationalization for illegally coming to the United States—the coming election of Donald Trump. What Germans refer to as the Lugenpresse is in Central America, interviewing illegal aliens. The Lying Press appear to be feeding a line to the illegals. The new Party Line for the new wave of massive illegal immigration is Donald Trump. Apparently the reasoning is that illegals want to get here before Trump is elected, thinking it will be harder once the wall is built. Sound reasoning, except that they seem to be ignoring the Deportation Force that President Trump will be deploying to deport these same illegals. Gang violence and poverty have for years pushed Mexicans and Central Americans north to the United States, but recently a new driver has emerged: the anti-immigrant tone of leading Republican presidential candidate Donald Trump. From the slums of Central America to close-knit migrant communities in U.S. cities, Trump's rise to the front of the Republican pack has not gone unnoticed and is partly behind a spike in the numbers of migrants trying to enter the country, including children traveling without guardians. "He's one of the reasons why people are crossing the border. They think he looks like a dictator," she said. "It's very dangerous for them to cross. But it will be worse if Trump is president ... Life will be very difficult for us. He doesn't want us here." That makes so much sense. And all very interesting, especially the later in the article admission by the Lying Press that illegal immigration under Barack Hussein Obama is increasing. This is something the Regime has been denying for years. U.S. Customs and Border Protection (CBP) data shows 150,304 migrants were detained trying to cross the U.S.-Mexico border between October and February, up 24 percent from the same period last year. Similar data for "unaccompanied" child migrants - those traveling without a guardian - is not yet available, but between October and January, 20,455 kids were apprehended on the southwest border, up over 100 percent from a year ago. In fact, the chart and underlying statistics are stunning. 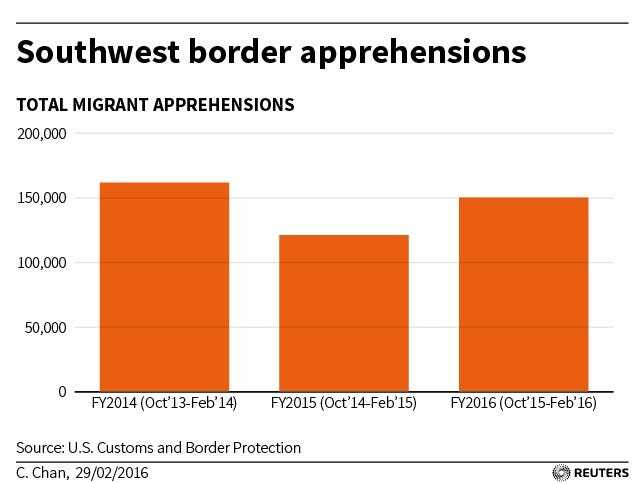 Apprehensions of illegal aliens along the nine U.S. Border Patrol Sectors along the Southwest border have achieved the same level in first five months of Fiscal Year (FY) 2016 as the total apprehensions in FY 2015, the year of the Obama Juvenile Illegal Alien surge. If the pattern for FY 2016 continues, apprehensions will double at the end of FY 2016. Clearly this is not attributable to Donald Trump. And the Lying Press buries the actual cause deep in the story, completely contradicting the claims by illegals that they are running to the U.S. just to get arrested by the Deportation Force sometime in FY 2017. "You watch the news ... There's a lot of fear among Latinos," Franco said, adding that a Republican victory would spell the end for proposed reforms to give many immigrants greater legal security. And by "greater legal security," they mean the ongoing Obama Regime Administrative Amnesty, which is what one calls a clue as to the real reason illegals are coming. They know that if they arrive in the United States, they will not be deported and will receive a permiso, the same reason they came in 2014, the Obama Regime Administrative Amnesty! After 22 paragraphs of lies about Donald Trump being the reason for the 2016 Border Surge, the Lying Press finally admits the truth, it's the permisos! Victoria Cordova and her 11-year-old daughter Genesis were deported back to Honduras in 2014, after hiking through Mexico and being detained trying to cross into Texas. She said coyotes in the Honduran capital Tegucigalpa - who charge about $7,000 per person - have been telling people now is the time to leave. "Lots of the women here were talking about it, and asked me if I was going to go," she said. "People here were saying that in June of this year they were going to give new entry permits." And that has been and currently is the material fact motivating the 2014 and current border surges, a promise of release and relief upon entry by illegal aliens.